So, it’s January and with the new month comes a sense of new beginnings, of purpose, of renewal. I do value that because it mitigates against the faintly depressing loss of festivities and fairly lights, and instead looks to the future. I’m not entirely sure of my Pilates future really…….so I’ll change the subject. Over the last couple of years I have found a new hobby: Astronomy. I love it, although sadly my interest is entirely academic. I have never looked through a telescope or even pointed a pair of binoculars at the sky. Instead I listen to radio programmes, read books and watch YouTube. I love it – it is endlessly fascinating, marvellous, crazy, unbelievable, awe-inspiring. There is something else that I really like about Astronomy: I don’t have to express an opinion on it, I don’t have to remember it, understand it, interpret it or teach it! We are told that the Universe started from an infinitely small point – a singularity, from which the universe has been expanding ever since. 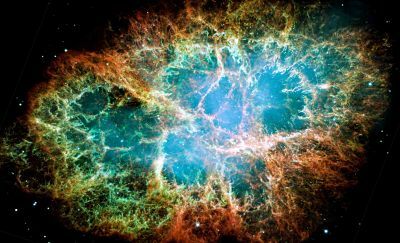 The Astronomer Fred Hoyle, an exponent of the Steady State Theory of the Universe thought this was so daft that he coined a disparaging term to describe it: The Big Bang. Well, the theory appears proven and its moniker has stuck. A few years ago, I, like Fred Hoyle, thought that my Pilates Knowledge would be Steady state. I would (thinking arrogantly and naively) acquire all the information about Pilates, and would become a good instructor, and well, that would be that. 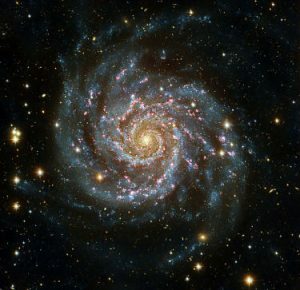 A Spiral Galaxy seen from a distance. I don’t know if Sir Fred was ever reconciled to the error of his ways. But I certainly have been! The stuff out there to learn as a Pilates instructor is ever expanding, 3-dimensionally around me. Some days I despair and can’t reconcile myself to my paltry knowledge relative to what is out there. On other days I feel really enthusiastic because I’m getting better at knowing where to look for information and getting better at retaining stuff because the foundations are there. I’m getting better at thinking outside the box if I have to and I’m kinda OK in the box too. I’m like a little solar system within, and definitely orbiting the Milky Way of Pilates. Pilates Future: What Would I Like to See More of in the Industry? More focus on freeing off the hips. More exercises in all dimensions. Pilates is very front to back (sagittal plane) and to an extent, side to side (coronal plane) but our bodies move through all dimensions and that should be reflected more in Pilates. Pilates meets Parkour eh! Pilates Future: What Would I Like to See Less of in the Industry? Pilates performed by young women in cropped tops with ripped midriffs. Pilates on Social Media which only seems to feature people doing high end difficult stuff that us lesser mortals can’t achieve. That lot might be best swallowed up by Sagittarius A, the dark brooding heart of the Milky Way and thought to be a super massive black hole. There are other galaxies of knowledge out there. There is the very bright and local galaxy of Yoga. Chief amongst my interest is Intrinsic Biomechanics. This particular star has gone Supernova and is outshining all the rest in the firmament of learning possibilities. I am training to be a Biomechanics Coach because there is so much I want to use with clients. My 2017 Pilates future will also include getting qualified to use the Wunda Chair, another piece of Joseph Pilates’ original studio equipment. There are many interconnected islands of knowledge out there. All potentially useful, all with varying degrees of accessibility. I also need to understand why it’s important to develop. What motivates me. Hmm, this is a bit more mysterious and more personal – the quantum mechanics of the system possibly?! For personal reasons I need to feel that I can hold my own against other movement practitioners; well, the local ones anyway. This is definitely self centred but I must confess that it is important to me. I’m not trying to be better than colleagues, competitors and significant others. That would be silly. Even attempting it would be impossibly hard work and doomed to failure. I just want to be in the mix and stay in the mix – credible, reliable, up to date. The other reason is more to do with everyone else. You guys pitch up to personal tuition and to classes expecting to be taught by, if not by an expert, then by someone who has expertise. You want help, reassurance, advice, tips, knowledge to use in order to heal, rehab, move better, feel better, relax. That is quite a lot of pressure to be honest. You are seeking knowledge and a physical space in which to do exercise. As a teacher I am the conduit of knowledge and as such maybe I’m not directly sought out for my own sake but nevertheless it is genuinely gratifying and humbling that people think I can help. So I must strive to do my best at all times. Is there anything else in the movement universe that will continue to influence what I do. Anything mysterious, unexplained? class vibe – cheerful, relaxed. Bored, hacked off? Did you think that I’d just thrown that in because it begins with P. Shame on you! 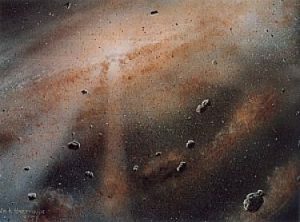 A Planetisimal is a chunk of matter formed from cosmic dust grains (often during the formation of a solar system). When the planetisimal is big enough – a kilometre or so in diameter then it is bound together via gravity. Planetisimals can then attract each other, also via gravity and ultimately form proto planets. 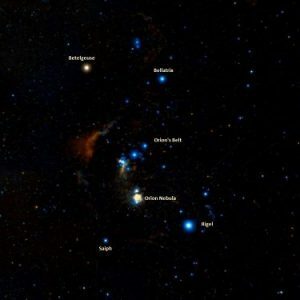 In our solar system, some objects in the Kuiper belt are Planetisimals and for me they are metaphor for random bits of information, not bound up in an overall body of knowledge, that you may unearth if you go looking for it – on a social media post, in a library book, from a conversation. In our Solar system, Planetisimals are mostly found in the Kuiper Belt or the Oort Cloud. Some, due to their size or the gravitational pull of another object, become Comets and Asteroids which then orbit the Solar System. One such Comet is Swift-Tuttle which passes by Earth every 133 years but whose debris is left permanently in space. Every year the earth’s atmosphere ploughs into the debris. It burns up in earth’s atmosphere causing a Meteor Shower. It comes from direction of the constellation Perseus, hence Perseid Meteor Shower. Every year I am showered with tips, information, nuggets of helpful knowledge. At my annual Fitness Convention and on Training Courses, which is why I bust a gut to go year in and year out – I receive my regular and reliable Perseid shower of information, updates, research. So there you have it: the gravity of my situation. What binds me to my chosen occupation, influences what I do and drives me forwards in to the foreseeable Pilates future. Love this Alison, we’re definitely on the same page in the things we would like to see in the future of the Pilates Industry, ie Core stability rather than strength and what we don’t want to see #notinacroptop. Here’s to a successful 2017! thank you Louise and maybe you could join me with some star gazing! !